Oil on panel, 58 x 76 cm. 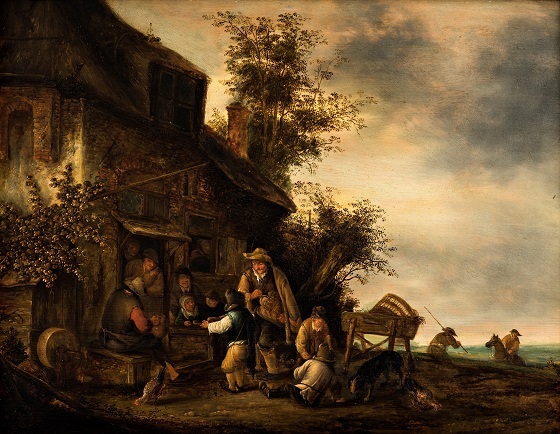 This painting of a cheerful scene outside a tavern was the first Dutch painting that Johannes Hage acquired for his collection. The scene falls under a genre of paintings from the Dutch Golden Age called vrolijk gezelschap (in English: ‘Merry company’), typically featuring a small group of people enjoying themselves with drinks and music-making. In this painting, two musicians are playing for the tavern patrons, who are listening with great enjoyment at the front of the tavern and from the windows. A man on horseback approaches the merry scene from the great plain in the background while a fisherman heads the other way. Not much is known about the artist Jan van Hens, but this scene, with its festive peasant life in the foreground and evocative landscape in the background, appears to be heavily influenced by Isack van Ostade’s village paintings.